What is Insurance and Even Money? Every Blackjack player is weary of the dealer landing a blackjack. When the dealer has an Ace, there’s that worry that the next card will be a ten-valued card resulting to a blackjack. Casinos understand that players are worried and thus offer Insurance against a dealer’s blackjack (technically it is a side bet on the dealer’s face-down card). To get insurance, the player places an insurance amounting to up to half the bet. If the dealer lands a blackjack, the bet is pays out 2:1 and if the dealer doesn’t have a blackjack, the player loses the insurance. Even money is also a kind of insurance. Technically it is also a side bet on the dealer’s second card. Even Money bet is given when the player lands a blackjack but with the dealer showing an Ace. 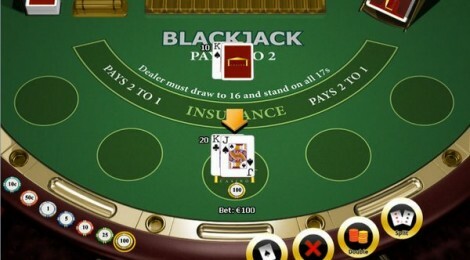 A player taking an even bet agrees for a 1:1 payout for the blackjack instead of getting a push (if the dealer also gets a blackjack) or a 3:2 payout if the dealer fails to get a blackjack. Note when the player has a blackjack and takes the even money bet is like buying insurance for the max payout. Even Money bet is given only to players with a blackjack unlike insurance which is given to all players. Most players do not see where the catch is. Let’s consider a case where you have wagered $40 on your card hand then you land a blackjack. Also let’s assume that the dealer face-up card is an ace. A lot of players do not see that there is nothing significant or useful about even money bet. In fact it is equal to getting insurance on a dealer’s blackjack. For example, you have wagered $40 on your card hand and then you are given a blackjack with the dealer having an ace card. If you want to insure your hand, you will likely part with $20 (half your wager). When the dealer reviews their hole card and there’s a blackjack too, you break even with the dealer. But you insurance wager will be lost. I.e. you will get a 2:1 payout for your $20 insurance and thus you will get your $40 back. If the dealer doesn’t land a blackjack, you will lose your $20 insurance but your blackjack will wager out the dealer. You will get a 3:2 payout i.e. $60 giving you $40 in revenue. Since having insurance in the case of a blackjack will get a one wager regardless of the condition, most casinos bypass the bureaucratic procedure and give straight even money bet. Winning, despite having a push, is something most players will resist, but the truth is the bet will cost you in the long run. If a player plays conservatively with a blackjack against a dealer’s ace, the chances that they will get a 3:2 payout altogether with the possibilities of a push will earn them more cash as compared with even money bet. The possibility of winning despite getting a push may be tempting to players. Likewise it makes some sense to have 2/3 of your money back instead of losing all of it. But if you are keen enough, you will realize the possibility of a dealer getting a ten-value card after your blackjack is less than 0.5.